Even more effective than Wind-Blox Classic, Wind-Blox Pro stops the most wind noise. 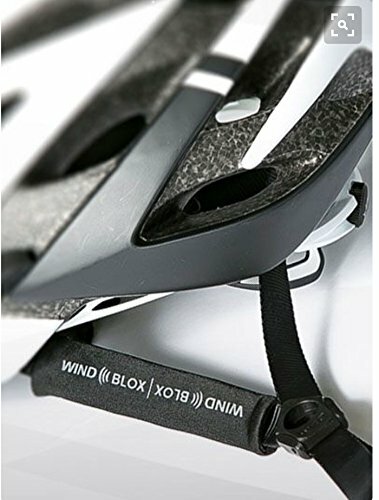 Wind-Blox patented design is wind tunnel tested and engineered to stop 80% of wind noise (average of 3 road test measurements was 80.2%) -- the HIGHEST rating of any other bicycle wind blocking alternative. Unlike ear plugs and headphones, Wind-Blox only block the wind noise, allowing you to hear approaching traffic, nature and fellow cyclists. Decibel meter tests show absolutely no reduction in desired sounds--while significantly reducing wind noise. IMPORTANT: 1) For helmets with front straps at least 4 inches long from rim to clip. 2) We are working to improve the fit for users wearing wide temple sunglasses. If you have any questions about this product by Wind-Blox, contact us by completing and submitting the form below. If you are looking for a specif part number, please include it with your message.